Little else is known of the medieval history of the Priory, as the Annals are now lost. Giraldus Cambrensis, accompanying Archbishop Baldwin on his journey through Wales in 1188 to preach the Third Crusade, mentions the party passing by the ‘little cell of Ewenny’, and the Priory was regarded since as no more than that. By the time of the dissolution of the monasteries in 1536, the number of monks at Ewenny had dwindled to three. The Priory was leased to Sir Edward Carne, who retained a priest in charge. In 1545 Sir Edward purchased the Priory, along with its possessions and those of Gloucester Abbey within the lordship of Ogmore for the sum of £727 6s 4d. The nave continued as the parish church, and a mansion for the Carne family built on the site of the monastic buildings. The Priory passed by marriage in the 18th century to the Picton-Turbervill family, who still own the monastic end, though in the guardianship of CADW, Welsh Historical Monuments. The nave is in the possession of the Church in Wales and is still used as the parish church of Ewenny. J.M.W. Turner’s water-colour of the interior of the Priory Church, painted in 1797, gives the impression that it was then used as a farm shed. 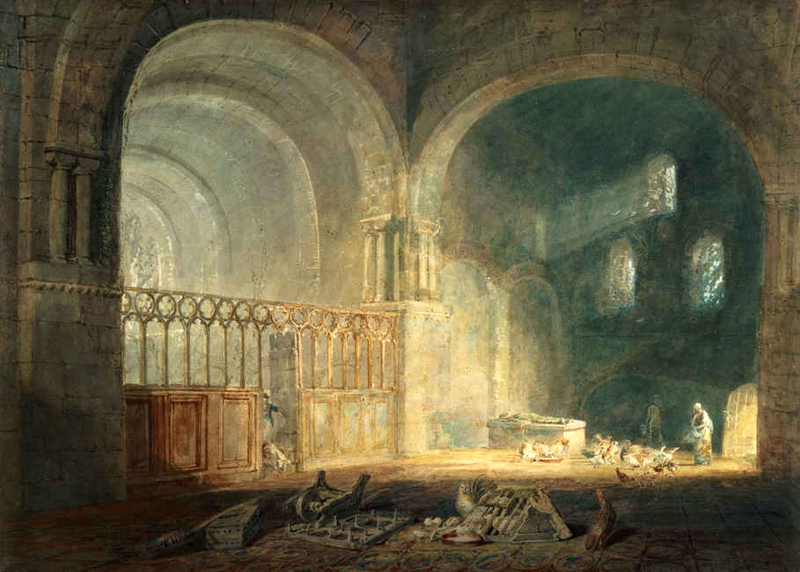 By 1803 the north transept, north nave aisle and west end of the church had collapsed; repairs were then made, and much of the Priory Church restored between 1869 and 1886. The north aisle and porch were reconstructed in 1895. The most recent restoration took place between 1998 and 2004, which included the insertion of a vestry, kitchen and toilet in the ruined west end, ramped access to the monastic end, and a glass screen above the wall separating the nave and the presbytery. A service of Holy Eucharist is held every Sunday in the Priory Church at 9.30am. Concerts take place regularly as part of the Ewenny Arts Festival.